His name was Paulo. My dear father was someone who cared a lot about people. He had a wonderful wife, my dear mother Isabel, and seven kids. I am the third. He was sixty-six and still dreaming about working on his van, transforming it into a camper, and traveling around in nature. He loved nature, especially the sea. I always had this same special feeling related to the sea. Now it is the only way I’ve found to feel connected to him. The sea, nature. Every time I visit these places I write in my journal pretending to talk to him. I am Brazilian with Italian roots from my father&apos;s side and I have been living in Europe for thirteen years now. 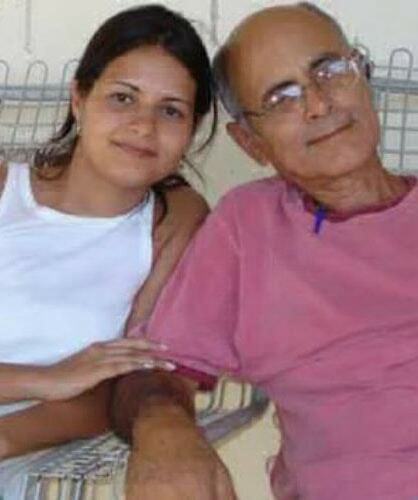 The last time I visited Brazil for the holidays before his death was at the end of 2013, after almost three years when I couldn&apos;t visit my family for so many reasons. I have the guilt of not making changes in my life to spend more time with my dear family, especially my father, who passed away on the twenty-eighth of October 2016. Last year I found myself visiting my dad in a hospital. He already suffered from heart disease, but it was stable and he could live for a long time according to his cardiologist. Then the doctors discovered he had metastatic bladder and kidney cancer; because of his heart condition he would not be able to have any treatment or surgery to save him, even if the cancer had been found earlier. It all happened so fast, and I only had two weeks with him. Together with my mom, sisters, and brothers I helped take care of him until his death. Until a few days before he left us, he was still dreaming about his van and his travels. Today this is what makes me wake up and remember myself to keep dreaming and live in a better way. Some of my friends didn&apos;t know what to say, and I felt their silence. I was silent too; I didn&apos;t want to bother them with my sadness because it always creates a weird situation. My boyfriend at first was an important support and a very good listener and I appreciated it so much, but after a few months he couldn&apos;t connect to me anymore. I feel guilty since my pain made me isolate myself, and I think it became difficult for him to sustain me, even though he kept trying. Some of my friends didn&apos;t know what to say, and I felt their silence. One year ago I founded a Lean In Circle in Bordeaux, part of the movement created by Sheryl. Most of these women are now friends, and they became my strength. Every time I meet with them I feel recharged. I go there thinking of helping others, but they also help me. Talking to them makes me feel better, and they listen to me and ask me questions. I am so grateful to have them in my life. Today my challenge is to reconnect to myself and reinvent the way I see life and people. I have always been interested in human behavior and have been searching for ways we can become better people. I discovered we just need to look deeper into others and listen more carefully to what they have to say. This mindset is allowing me to slowly improve my relationships with friends and my partner. I wish I could have listened this way to my father before his death and share his feelings. Instead my family and I avoided it because we just did not know how to deal with the conversation ... it was too painful for all of us. Grief is a long path, and I want to live it in peace for myself, my loved ones, and for my father&apos;s soul. Option B came out during a very hard moment and it gave me strength to understand my pain and how to deal with it.